Here is a picture of my seaglass window that I thought you might enjoy. Some of the pieces are worn more then others. The light shines through it. I have it hanging in my sun room. I can't take all of the credit. My husband makes the frames for me. I use Plexiglas for the background and then I glue the pieces of seaglass on with E6000. You have to use Plexiglas because if you try gluing them on regular glass, the glass will crack from the weight of the seaglass. It took me a few attempts to find this out. I would love to know what is used and how it is applied to stain white sea glass for art pieces. Can anyone help with information like brushes or dobbers, what kind of stain used, etc. Can you tell me what type of resin you would use for sea glass windows/projects? Lori - try the search box on the right and enter the word glue or epoxy and see what comes up. 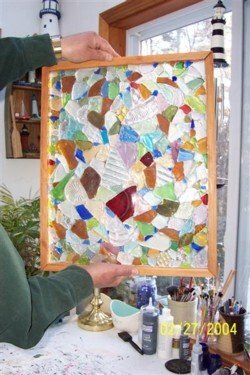 I've used Mosaic Mercantile glue successfully with sea glass adhered onto a window pane. It goes on with a milky white color, but dries clear & quickly. No cracks, no breaks in the window pane. How thick a piece of plexiglass are you mounting to? Each piece has a story. You also have a story while you are looking for these gems, once trash. 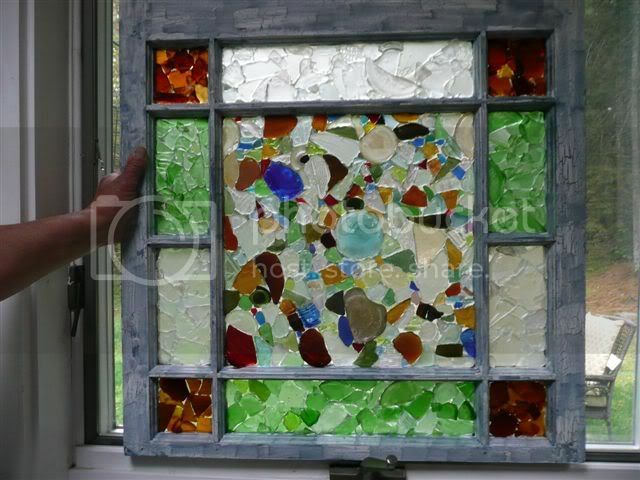 Tumbled glass or stained glass is just more garbage waiting to happen, when the miricle is that the ocean has returned our trashy mistakes as beautiful treasures. "Fake" sea glass is just more future trash! Hi, I have a window over shower in bathroom that is 14" by 34". Can I just glue beach glass to it or is it necessary to use a piece of plexiglass with a frame and mount it in front of existing window? I read about the windows cracking and wonder how serious the cracks are. We live in Baja, MX so cold weather isn't a factor at all. The window is on north side of our house. I love your framed beach glass. I am just wondering how you made the frame? Is it a normal frame then just attach the plexglass to it somehow? I have been collecting beach glass for over 30 years and I would love to make one. You can color your white seaglass using food coloring and either elmer's glue or matte Mod Podge . Hello I love your window it is beautiful, but I have a lot of rounded sea glass. How did you use those pieces? I use E6000 for glue. I always glue to plexiglass because I have never had luck gluing seaglass to glass. It cracks the glass every time. Try having someone make you a frame that is like a shadowbox that has glass on both sides and then gently drop your seaglass down in between them. i bet that would work. turned a rainy day in Eastport-Sunny! I found your window! It is great. Hope to see you! I can't give up my secret spots but I will tell you that it is in the midcoast area. what beach in Maine do you find such different colored pieces of glass?? Your window is just lovely! This time of year in mass. it's hard to be outside much, but you have inspired me to get back to work with my seaglass. I've made jewelry along with frames using seashells, pottery and seaglass. Think I could hire your husband to make a frame? I don't stain the glass. This is all natural the way I found it on the beach. How do you stain seaglass? What do you use? I have so many whites and would love to stain them cobalt blue or red even though that would sort of "cheating". how to stain sea glass? HI! I'm also wondering what you used to stain the seaglass cobalt blue?? Hi Mona, I also have been doing windows for years now. One of my favorite spots for collecting is Monhegan island. I cant believe there are two of us. What would I use to stain the glass. And you can perfectly stain the beach glass. One all natural and one where I stained the clear and light aqua pieces cobalt blue and dark aqua. Will post pictures on this site by Monday. I used glass epoxy to apply the glass, perfectly and seamlessly. I lucked out and found a beach just loaded with well worn, odd colored glass. I want to do something with our lovely glass that we collect on Lake Erie and am going to give this a try - not sure what E6000 is but will ask at the store -thanks again! !